Oh, dear readers. Sometimes we come across something so special, so elegant, so surreal... that it just takes the words right out of our mouths. In this case, though, that's a good thing, because these works of art do a pretty fantastic job of telling their own stories. 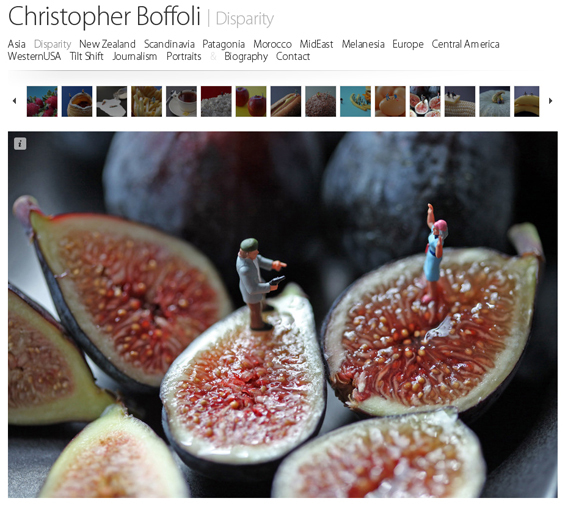 Photographer Christopher Boffoli has a wide-ranging body of work, from photojournalism to portraits to incredible Western landscapes, but our foodie heart belongs, naturally, to his Disparity series, which uses miniature figurines arranged on food landscapes to tell a tale. And like his body of work, these tiny tableaux offer a range of stories that run the gamut from sweet to strange and back again... just the way we like it. It was too hard to decide which one to post, but the rest can be found here. Happy scrolling! Awesome! Love these photos and couldn't resist looking at the rest of his collection. Thanks for sharing.